This wedding happened to outdoors on a somewhat dreary Saturday afternoon. Storms brewed all around, but thankfully held off for the ceremony (and that's about it!). However, one of the benefits of cloudy, drizzly days is the pop they add to anything with color. The clouds are a big light softener and, coupled with rain on the leaves, they give the skin a beautiful brightness and lightness and add a punch of color to things that might be a touch bland without. The simpleness of this image is a reminder that some of the greatest moments of true love and wonder happen at times that might be overlooked - as this happened immediately after their first kiss as husband and wife. There ceremony was lightly dotted with showers, but the guests reminder cheerful and exuberant for the events to unfold. The guys waited patiently as the ladies made their walk down the aisle, until finally all were assembled and only the bride remained. Jenna was beautiful in her fitted dress as she was escorted down the center walkway by her dad. She glowed with love and excitement, despite the gloomy day. The officiant had already approached me and given me full control of all photographic opportunities, something very rare in this day and age. I moved around as I normally would, quietly staying to the main and outside aisles. He had also mentioned that upon pronouncing them, he would move out of the way to allow for a image of the first kiss without him in it. Also another rarity. As the time came, I internally wondered if he would remember. And when the time came, he did. 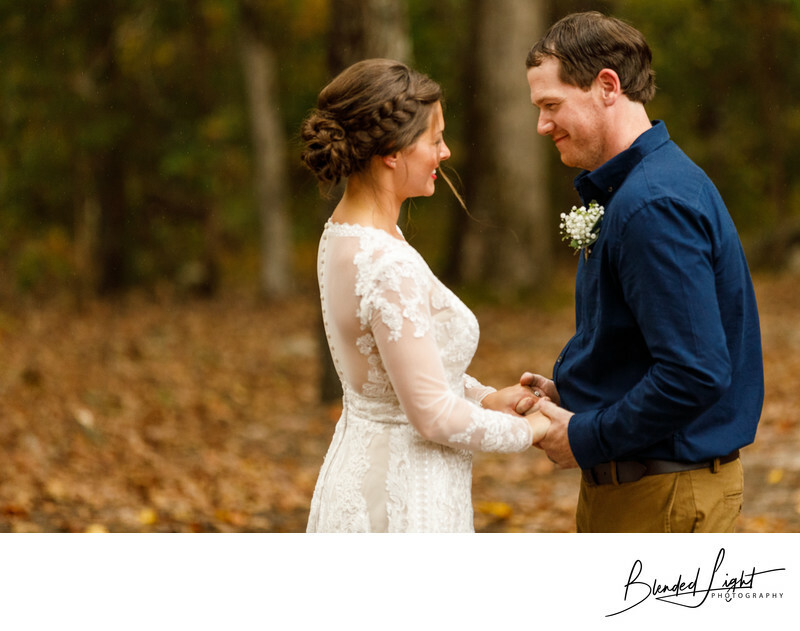 Their first kiss shots were backdropped against a gorgeous fall background, without anyone in them, providing a type of accepted eyesore. But, rather than stop shooting to prepare for the couple's walk down the aisle, I held the camera up a few s seconds longer to see what might happen. This image is what happened - husband and wife, holding hands while looking at each other and sharing a congratulatory smile. The Parlour at Manns Chapel is one of North Carolina's top wedding venues - and for good reason. Tucked away from the hustle and bustle of the Triangle cities, the little corner church offers everything a couple could ask for - rooms to get ready, an open courtyard for cocktail hour, a gorgeous setting for an outside wedding and a old church for a backup if the weather doesn't cooperate. The wooded background makes a superb setting for outdoor weddings, completely surrounded by large oak and pine trees. In the fall, when the leaves change, there is nothing better. The gravel courtyard between the church and the outdoor ceremony area is sizable, with string lights running across the area. It is a beautiful spot for assembling before the wedding or having that outdoor bar area. The church itself is beautiful space. Completely redone, it retains it's original character with dark wood floors and low light levels, creating an enchanting feeling. If you're getting married at or considering The Parlour at Mann's Chapel, I would love the opportunity to be your photographer. If I can help in any way, please call me at 252-341-0974 or drop me a line via email. Location: 175 Poythress Rd, Chapel Hill, NC 27516. 1/1250; f/2.8; ISO 1600; 165.0 mm.